Expands beyond team messaging-oriented HipChat with all-in-one solution for team chats, audio and video meetings, and collaboration. If you've been following the rise of team collaboration tools, then you'll recognize HipChat as an early-to-market entry -- launched in 2010 and acquired two years later by Atlassian, the same company that offers up popular workplace tools like Jira, for project management and service desk support; Bitbucket, for code sharing; and Confluence, for content creation and sharing. While HipChat has matured nicely under Atlassian's care, it turns out that it's not the company's endgame. Taking the lessons learned from internal and external use of HipChat, Atlassian today introduced a next-generation team collaboration -- or as it says, "team communication" -- tool, called Stride. 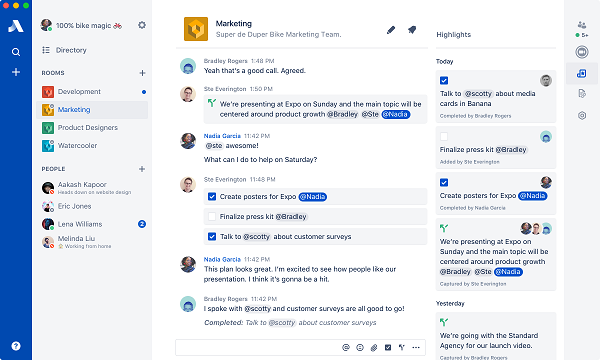 Built from the ground up, Stride is "the largest and most substantial thing Atlassian has ever brought to market in our 15-year history," Steve Goldsmith, GM of HipChat, told No Jitter. Better team messaging that produces "more signal, less noise"
Native collaboration tools for tracking and moving work forward "so you can get more done with less talk"
By blending together team messaging, video meetings, and collaboration tools in the communications experience, Atlassian looks to deliver a "better together" story, added Oji Udezue, head of product. He shared some of Stride's highlights in a quick demo for No Jitter. In creating stride, Atlassian took insights gleaned from HipChat use and "added hundreds of improvements" to enrich team messaging, Udezue said. For example, Stride team messaging includes a rich text editor that allows short- and long-form messages complete with fun stuff like emojis and other media; features tools for developers; and supports rich media, file security, multithreaded, image annotation, and so on. For video meetings, Stride lets anybody escalate from a text conversation to video and initiate ad hoc meetings, calling out to landlines or sharing calling numbers via text, for example. The video meeting capability also supports screen sharing and remote desktop control, and integrates with Google and Microsoft calendars for click-to-join meetings, Udezue said. And as for those crippling team messaging notifications... while Atlassian overhauled the notification server architecture on the technology side, it also recognized the need to help people "manage the inundation," Udezue said. As such, Stride provides per-room notifications and controls that let users customize how they receive messages. 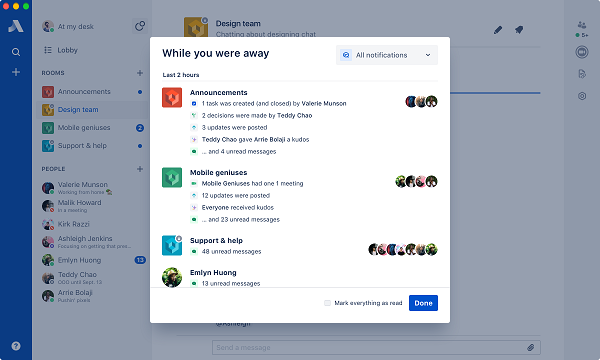 In incorporating collaboration into the messaging medium, Atlassian worked to help users end their ceaseless scrolling through reams of team conversations. It has done so by enabling users not only to elevate important messages using tags such as "Create Decision" and visuals such as checkmarks -- easy to find during quick scans -- but also to bring those important messages outside the conversation into action-oriented sidebars, as shown below. With the sidebars, a user can catch up with what's been going on, and then dive into the stream to get more context, Udezue said. Stride takes the IM/presence to a new level, too. Users can take themselves out of the real-time conversation by placing themselves in "Focus Mode" that goes beyond the typical do-no-disturb notice by providing other users with information on what they're working on and when they'll be done. They can then catch-up -- "getting back into the stride of things," Udezue said, with "while you were away" highlights. "This all adds up to trust," Udezue noted. "One of the big things we know our customers care about is that it's too hard to read everything, and because it's too hard to read everything they never want to step away for fear of missing out. With actions and decisions, you can step away, come back, and see the important stuff." Atlassian is offering Stride as a free, zero-click transparent upgrade to any HipChat Cloud customer that wants a more comprehensive team communications solution, Goldsmith said. It's offering a free version, for an unlimited number of users, and a standard package priced at $3 per user. The standard version includes unlimited message history and file storage (compared to 25K and 5GB for the free version), as well as screen sharing, guest access, advanced video, and user management features not available in the free product. Atlassian considers Stride no less than a complete redefinition of team communications. What about you?